While it's hard to even think about summer with the holidays coming up, summer internship search season is in full swing for college students. And at Jopwell, my teammates and I get to both watch and help thousands of undergrads from schools across the country navigate the process. We know personal connections can be useful during most job searches - whether you're reaching out to someone you know for intel or applying to a competitive program where a referral could get your résumé towards the top of a heaping pile. As a college student, though, you likely can't reel off names and emails of people in your extended network who are already working at the companies you're eyeing. 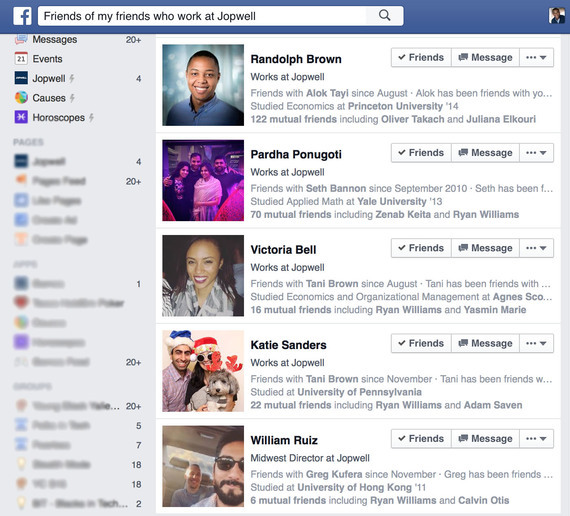 Enter Graph Search, the nifty Facebook feature a college junior introduced me to last week. After identifying specific internship programs, she explained that she'd been using Facebook to connect with current employees at those companies. To demo this process, she pulled up her Facebook profile page and typed "Friends of my friends who work at Dropbox" into the search bar. Within seconds, her search surfaced profiles of four second-degree connections - i.e. people who she didn't know (yet), but who identified as Dropbox employees and shared at least one mutual friend. Suddenly, she knew exactly who she could reach out to for a potential introduction. Other students I've spoken with confirmed that they've also been using Graph Search to find useful contacts at all sorts of workplaces - from startups to hospitals to consulting firms. One sophomore added that he'd just searched his network for "Friends who live in San Francisco" to remind himself of people he could consider reconnecting with while in town for an interview. What a cool way to figure out who you know - and how they might be able to help. My team has been noticing a throwback trend: Some of the most ambitious, tech-savvy undergrads we've met this year, whether on campus or in line at Starbucks, are using paper business cards to stand out and keep in touch. Yes, paper. These cards aren't just coming from student CEOs. They're coming from writers and designers who want to share the link to their portfolios, or coders connecting you to their Githubs, or aspiring academics directing you to their online research, or photographers sharing their work via Flickr and Squarespace. It's more than a business card, and better than a résumé; it's a direct example of the work they are capable of. I'll add that the cards we're seeing are anything but "old school." Some are miniature. Others are textured. Many actually include a QR code that recipients can scan with their smartphones - a useful way to bring offline connections back online. Seeing students take on part-time work is nothing new, but we've seen some notable displays of students actually using these jobs on-demand services like Uber, Lyft, and TaskRabbit to make money while networking, especially in urban areas. One example? A USC student looking for an internship at one of the major Los Angeles production studios told us she planned to pick up riders almost exclusively from her shortlist of talent agencies and studios and take the opportunity to strike up networking conversations with passengers and hand out her CV. At a recent recruiting event, we saw an exchange during which a Stanford student had signed up to be an on-site TaskRabbit, to stuff envelopes. He arrived promptly, did a great job at his task, and had his résumé (and business card!) with him. When he finished stuffing, he started a conversation with a recruiter from a tech company, who ended up asking for his information. Undergrads: please keep networking. The resourcefulness, discretion, creativity, and communication skills are things we hope you'll bring to the workforce this summer and beyond. Porter Braswell is CEO and co-founder of the diversity recruitment startup Jopwell, which connects Black, Latino/Hispanic, and Native American professionals and students to recruiters at leading companies. 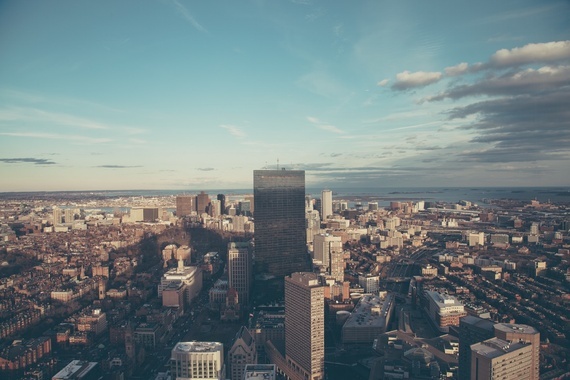 He writes about recruiting, workforce diversity, and the startup grind. Follow Jopwell on LinkedIn and Instagram.